The Commission organised a seminar regarding the evaluation of the Code of Conduct in 2016. The event included extensive discussions with educational institutions, umbrella organisations and other interested parties about the functioning of the Code of Conduct. The seminar was well-received and the Commission looks back on it with contentment. Quite soon the question was put forward when the following meeting would be organised. More specifically the Commission sees grounds for a seminar based on an exploratory study it made into the study progress and supervision of international students. 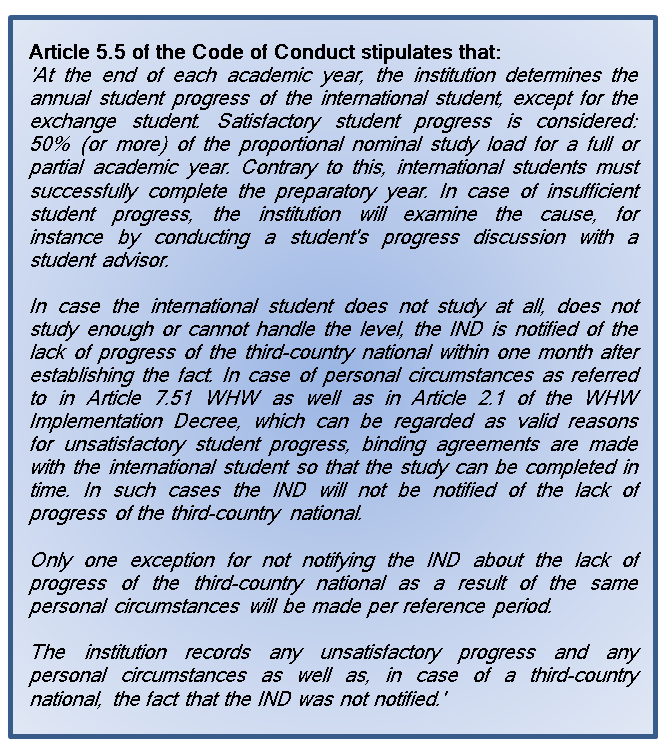 In connection with Articles 2.1 and 5.5 of the Code of Conduct, the Commission started an exploratory study into the study progress and supervision of international students at the end of 2017. Article 2.1 contains the duty of informing international students about the study progress standard and the consequences of not meeting the requirement. The standard is set in Article 5.5. When a student does not make sufficient study progress, the institution must determine the cause, for example by conducting a study progress interview. In case of a non-EU student who fails to perform satisfactorily without a valid reason being given, the institute will be obliged to deregister the student with the IND. The purpose of this provision is, on the one hand, to promote the international student’s progress, and on the other hand to keep an eye on the student. Article 5.5 came into force together with the Modern Migration Policy in 2013. Five years later, the Commission is curious to know from the educational institutions how this provision works in practice and how it is implemented. The Commission made a questionnaire for the theme, which it submitted to the various existing consultation structures in higher education. The issue was discussed in meetings of the University Platform Internationalisation (UPI); the Commission Foreign Students (KBS; university student counsellors); the International Relations Forum for Universities of Applied Sciences (HIB) and the National Organisation of Student Counsellors in Higher Professional Education (LOShbo). 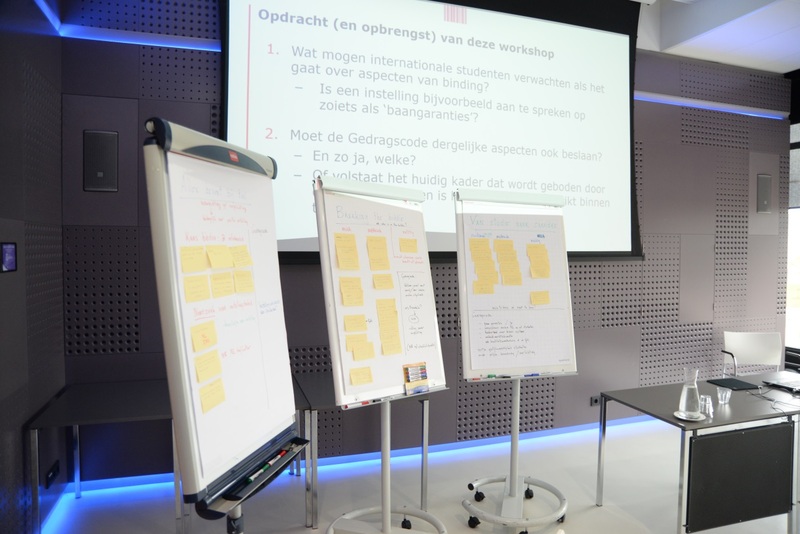 The Netherlands Board for Training and Education (NRTO) organised a meeting for its members that signed the Code of Conduct. The exploration gave an insight in how the information about the study progress standard was organised and how it was implemented. The Commission is of the impression that the scheme can be executed adequately, but that it also requires an investment in time from the institutions. The latter is especially the case when an institution is being confronted with a large number of non-EU students. An interesting subject is the difference in the responses of the student counsellors of universities, their colleagues of the universities of applied sciences and policy officers. The policy officers are of the opinion that the standard is just part of it all. Monitoring the study progress will provide additional administrative tasks, but in return the application and renewal of residence permits will be simplified. Furthermore, the standard is low when compared with the binding study recommendation (in Dutch BSA). The university student counsellors are familiar with the issue in their daily practice. They know the individual students and sometimes have a hard time applying the rules in a justified manner. The student counsellors in higher professional education state that in the past 15 years the supervision of (international) students has matured and works fine. The private institutions report to have only few problems with the study progress standard. The institutions emphasise the importance of good supervision of students and the prevention of backlogs. In private education only an occasional student does not meet the standard and has to return to their home country. The above shows some of the findings of the Commission and demonstrates that the topic is suited for wider discussion and sharing of experiences. We would like to formulate best practices. The participants of the consultation structures responded enthusiastically to the suggestion to discuss the subject during a seminar. The Commission is pleased to invite you – staff members of international offices, policy advisers in the area of internationalisation, admission officers and stakeholders in the Code of Conduct – to the seminar that it will organise jointly with the KBS and Nuffic on 10 October 2018. In addition, there seems to be a mismatch between the Higher Education and Research Act (WHW) and the Aliens Act (Vw), which is a second topic that will be discussed in one of the workshops on 10 October. Institutes are obliged to deregister a student from the IND if the student does not make sufficient study progress and does not have a valid reason for it. However, such a student cannot be refused if they re-enrol for the same programme. Also within this context, institutes have expressed the need for more legal possibilities to select students when admitting international (non-EU) students, for example on the basis of study motivation or diversity of nationality in the classroom in order to promote an international classroom. The institutes expect that a stricter selection may contribute to less study delay and reduction of the dropout rate. How do the institutes deal with this issue? And can we arrive at a supported working method that for the time being will provide an answer to this issue? These are questions that the Commission would like to discuss during the seminar.